We can offer one of the fastest lead times in the industry through our efficient and consistent manufacturing processes and attention to service. Find out how much you can save with our cabinets by simply filling out the form here. No obligation and no pressure. Keep reading below to find out how we can save you up to 30% OFF on quality cabinets below home depot kitchen cabinet prices. Got questions, want to know pricing, or need an estimate? Fill the form below and we will contact you shortly. Or call us now at (866) 665-6467 No Obligation and No Pressure. Guaranteed! Looking for discount cabinets in Atlanta? 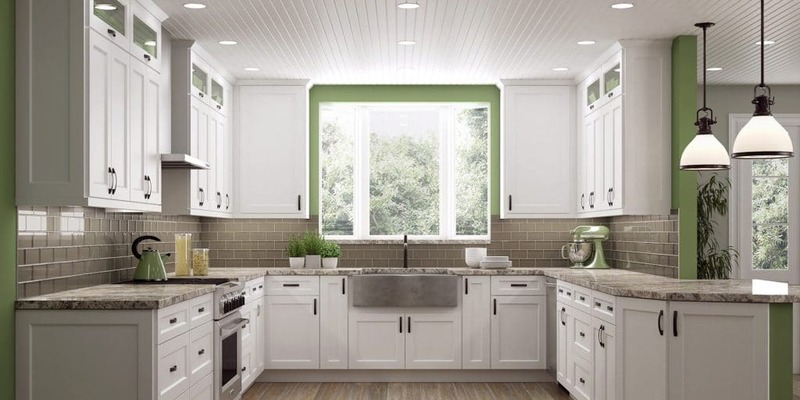 Well, everyone knows selecting new cabinetry for your home can be a massive expense and remodeling cabinets can take as much as 40 percent of your kitchen or bathroom renovation budget. Once you choose and set the design of your cabinetry, they are going to stick with you for years, feel the pressure? The design and trends of cabinets are in constant state of flux. So, choosing the right one for your home is very important. Before you start your search for discounted price, take a look at some tips that you should follow while looking for cabinets. There was a time when to distinguish high-end cabinets, all you need to do was look for dovetail joints inside the drawers. But with the advancement of cabinetry industry, many manufacturers offer premium features even on low-end cabinets, so, this way of distinction has become obsolete. It is always best to do your homework. This will not only save you time but will also enable you to save some extra cash as well. To buy discount cabinets in Atlanta, look for manufacturers and retail websites online and also visit the display stores. In this way you will be able to distinguish between quality cabinets from the polished replicas. Always trust your taste. Your cabinetry must complement the rest of your home, so choose wisely. There are a total of three types of cabinets available in the market: stock, semi-custom and custom. You can find stock cabinets that are pre-assembled at home centers. However, some stores also sell versions that require assembly. Stock cabinets are usually limited in style and colors. With semi-custom cabinets you can get more style and configuration options which offer a more accurate fit for your home. Custom cabinets are going to cost you the most but with the increased price, you will get many added features and extra specs as well. There are basically two styles: framed or frameless. 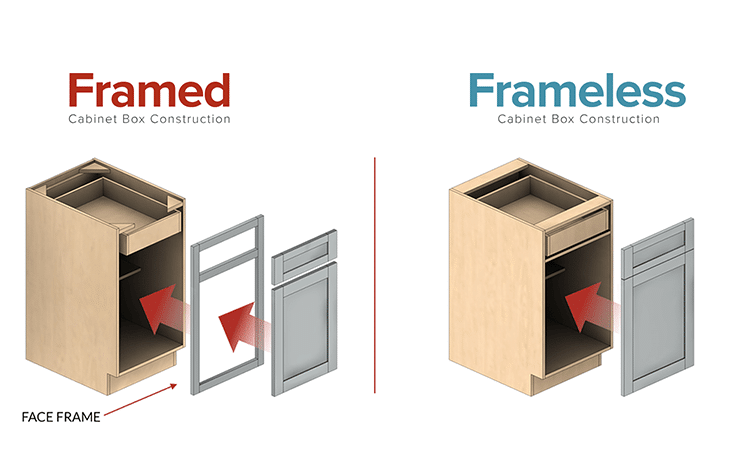 In framed style, cabinet is made up of a box and face frame on which doors and drawers can be attached separately. This style of cabinet is known as European style. As the name suggests frameless cabinets drops the face frame and doors, plus the drawers are directly attached to the cabinet box. This gives your cabinet a more contemporary look and interior access becomes easier, but this compromises the rigidity of your cabinet. To compensate the rigidity many manufacturers, use a thicker box. Now, if you are looking for a European look but desire a framed cabinet, then you must choose a full- overlay door. This will cover most of the face frame, thus give you your desired look. If you want to determine the quality of a cabinet always keep in mind that well-built cabinets feature solid wood drawers with dovetail joinery instead of stapled particleboard. Rather than an integrated rail, they have full extension drawer guides. They do not use veneer particleboard or MDF panel, instead they use solid wood frames surrounding a solid wood or plywood panel. The extra features can cost you more but they come in handy are quite useful. These feature not only provide you easy access to your cookware but also assist you in doing other chores more easily. Some useful features include a pullout trash can or a built-in charging station. Spring loaded shelf is also a great and useful feature which offers easy access to your cooking accessories. A home remodel requires a vision and an ambition to have a perfect interior design. At Woodstone Cabinetry, we have everything you need to make your dream kitchen or bathroom a reality and that too at very affordable prices. We provide top notch, beautifully crafted discount cabinets in Atlanta assembled with solid wood. Our kitchen cabinets are made from the finest wood that will not only last long but will also increase the beauty and value of your home. How are our quality kitchen cabinets affordable? Are you a little confused that why our cabinets are so affordable? This is because Woodstone Cabinetry provides factory direct cabinets to its customers. Woodstone Cabinetry manufactures the cabinets and makes the dream of high-quality discount cabinets in Atlanta a reality. Our cabinets are inspected and even tested for their quality right after being crafted from the finest wood. From simple to modern and from elegant to luxurious, our vast collection of bathroom and kitchen cabinets are capable of achieving any style. Our company has a command on premium solid wood and plywood. 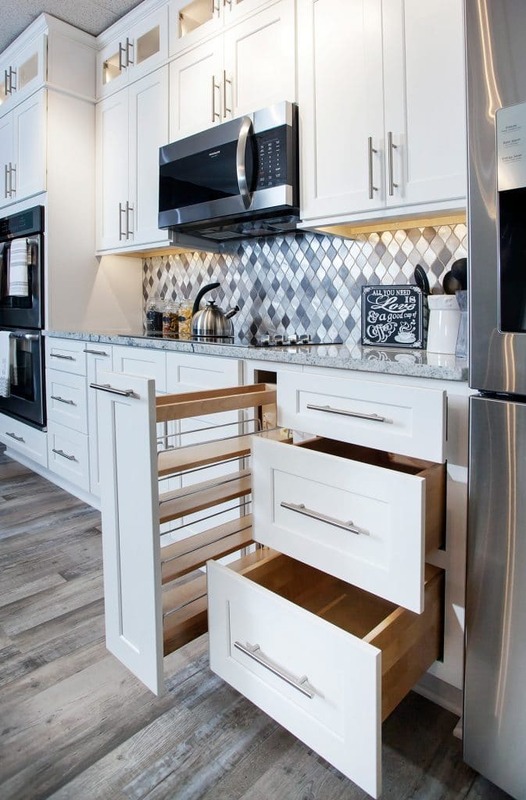 Our cabinets feature drawers and shelves that are guaranteed to withstand high pressure and provide great storage space to store household items including cookware and dish ware. Woodstone Cabinetry has provided bathroom and kitchen cabinetry to one of the finest houses in whole Atlanta which satisfy and match everyone’s desires. When you buy cabinets from Woodstone Cabinetry they are not only one of the best in the industry but also have a wide range of configuration capabilities. We also conveniently provide shipping and delivery right to your doorstep with a bar-raising lead time of only 5 days which is one of the fastest in the industry. We offer nationwide delivery as well. With over 150,000 cabinets in the stock, you can order online at any time. With our efficient and consistent manufacturing process and attention to service, we guarantee you long lasting, durable and gorgeous discount cabinets in Atlanta. No matter what your remodeling budget is, Woodstone Cabinetry can accomplish it. Request a Free Estimate today to find out just how much you can save with Woodstone Cabinetry! I just had to share my story about my purchase from Woodstone Cabinetry. I had just purchased an older home and the bathroom really needed updating. Kristie Hornkohl helped me from beginning to end. She helped me pick the perfect vanity, sinks, hardware and cabinetry in the most beautiful rich color York Chocolate! This is the bathroom I have always dreamed of. Thank you Kristie for making this renovation a wonderful experience!! This place provides the best customer service. Kristie welcomes you and treats you like a friend rather than a customer! Highly recommended place for cabinetry. How Long Do I Have to Wait for My Cabinets? Our ready to assemble units will usually arrive after 2 business days minimum. If you’d prefer that your cabinets be assembled by the professionals at Woodstone Cabinetry, your cabinets will be shipped to you within 7-10 business days. Do You Have Standard Shipping Rates? Yes! Standard shipping rates should be well… standard. We’ve streamlined the shipping rates for you, and designed a flat rate schedule. Rates are set according to your zip code in the United States, excepting Alaska and Hawaii. How About Refunds and Exchanges? Cabinets that are ready to assemble will only be accepted for credit within two weeks after delivery. The recipient is responsible for shipping costs to get the products back to Woodstone Cabinetry. There will also be a 25% restocking fee added to all returns. If you want to get credit or exchange, you need to get a Return Authorization number from us before shipping your return. We will then give you a return authorization number along with shipping instructions. Every item that we receive with a return authorization number must be returned in good condition and in its original packaging. When we receive your item, we will inspect it for damages. Give us 7 days to inspect your return. If everything checks out and the return is intact, credit (minus shipping costs and a 25% fee for restocking) will be applied to your account. The policies of the manufacturers that we receive our assembled cabinets from don’t allow us to accept any returns for cabinets which have been assembled for the kitchen or bathroom. Before ordering assembled cabinets, make absolutely sure that all pieces have the correct measurements. If, in the rare instance that your assembled unit(s) has/have been damaged during shipping, we will replace it ONLY with an identical item from our inventory. We accept Mastercard, Visa, Discover, American Express, Paypal, and electronic checks. Before an order is processed, full payment is required. Once the order has been processed, no changes can be made. Make sure that your measurements are correct before placing your order. If you cancel your order prior to it being picked, there will be a 10% processing fee. If you cancel after the order has been picked, it will be subject to a 20% restocking fee. Rush orders are available, simply email us at Woodstone Cabinetry and tell us your situation. RTA (Ready to Assemble) cabinets will be shipped to you within 2 business days of your order. If your cabinets need assembly, allow 7-10 business days. All freight orders are individually packed in boxes, shrink wrapped, then placed on a pallet. 3-5 days is the standard shipping time, and you will receive a tracking number after the order has shipped. In the case of residential deliveries, the delivery company will give you a delivery window of between 3-4 hours the day before delivery. The shipping will include one delivery attempt, so please ensure that you are there to receive the shipment. Woodstone Cabinetry believes in upholding and maintaining the privacy of all of our customers. To that end, we have placed SSL technology on our site as well as instituted other security measures. Your browser will be able to confirm this security for you, usually to the left of the URL bar. See your browser’s instructions for more details. All orders must be paid in full through one of the accepted payment methods before it will be shipped. You will receive an invoice via email once it is processed and a physical one at delivery.